The USS Bowfin Submarine Museum and Park is conveniently located within the Pearl Harbor Visitor Center. 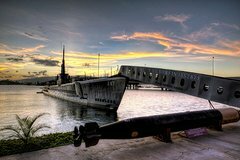 This incredible destination offers to two separate tours - the USS Bowfin Submarine Tour and the Submarine Museum Tour, both come with complimentary audio tours and are included in the price of admission. The USS Bowfin Submarine was launched December 7, 1942, one year after the attack on Pearl Harbor and was nicknamed the Pearl Harbor Avenger. Credited for sinking 44 major ships on nine patrols, the USS Bowfin became one of the most decorated submarines of World War II. This incredible destination offers to two separate tours; the Submarine Museum Tour and the USS Bowfin Submarine Tour, both come with free self-guided audio tours that are included in the price of admission. Visitors first discover the largest Submarine Museum in the Pacific, and take a self-guided audio tour on the history of undersea warfare; beginning with the first submarines ever built, to World War I, World War II and the modern nuclear submarines on patrol today. Visitors then proceed on a fascinating self-guided audio tour within the USS Bowfin Submarine itself, and go compartment by compartment to learn how more than 80 sailors and officers live on their four month patrols. Both of the Submarine Museum and the USS Bowfin Submarine are fabulous tours and can be completed in approximately one hour. These tours are available in English, German, French, Spanish, Chinese, Japanese and Korean. Visitors have a choice between the audio tours designed strictly for adults or visitors can choose the family audio tour, both on the submarine and in the Submarine Museum.